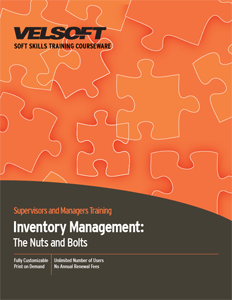 Inventory Management Training Materials are designed for trainers to develop supervisors and managers to learn the “nuts and bolts” of inventory management. Teach your management how to define inventory, the steps to setting up a warehouse, the receiving process, maintaining accuracy and much more! Seeing is Believing This sample manual to teach Inventory Management is in MS Word format. Most companies carry too much inventory. "You can't sell from an empty wagon" is usually the reasoning. Being over-stocked means the company will likely not run out of anything. But what about the inventory that has celebrated a few birthdays in the warehouse? Has anyone stopped to calculate the true cost of worrying about "running out?"